LUMUT, Sun: SMK Dindings principal Tiong Ting Ming is living proof of the adage the word “impossible” only exists in the dictionary of fools. The fact is this gentle-looking 49-year-old man has achieved a gargantuan feat. He single-handedly turned a dilapidated school into a high-tech learning institution. 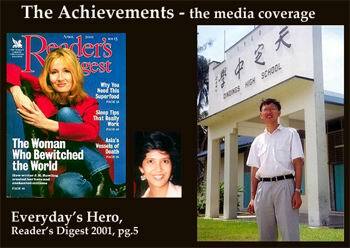 His achievement even caught the attention of the Readers Digest which featured him in an article entitled Everyday Heroes. During a recent interview with The Sun, the father of three was more than eager to share his thoughts and challenges in undertaking a task which was once look upon by the local community as impossible. It all started in 1992 when he was promoted as principal of the school whose reputation rested more on its termite-infested wooden buildings, and with an enrolment of about 300 students. The condition of the school left Tiong in shock when he first set foot in it. Tiong decided to do something about it – he gritted his teeth and began to revamp the whole school turning it into a high-tech learning institution. From then on until August 1997, he practically begged and twisted the arms of many people into donating for his cause, netting more than RM1 million in cash and kind. All this went into the renovation of the older blocks and the construction of a three-storey building which he lovingly refers to as cyber classrooms. “The whole building is interlinked via conduits for data cables.” In fact all the buildings in the school are interlinked via Local Area Network (LAN) while the fixing of the fibre optic cables were undertaken by Thomas & Betts, a US- based company, he said. Having achieved this, he strived harder to get more donations to set up three computer laboratories in the new building and managed to raise another RM800,000 last year. He also envisioned setting up a school which provides state-of-the-art Information and Communication Technology (ICT) for students. He managed to sell this idea to several big corporations. Among the major corporate sponsors who helped were Sapura IT which contributed 25 personal computers and the LAN system worth some RM150,000. Mimos provided the school with Internet connection worth RM60,000 while Thomas & Betts came in with fibre optic cables worth some RM100,000. Hock Hua Bank Bhd donated 60 units of 486-100 NEC central processing units while 3Com Asia Pacific Ltd lends a helping hand with the technical aspects under the Netprep programme. NetPrep Curriculum & Equipment provides the school with the necessary teaching syllabus and course materials in a bid to ensure the whole programme is a success. Despite having all these facilities, each student is only charged a nominal fee of RM10 per month while the Parents and Teachers Association (PTA) sponsors 50% of the RM10 for each poor student. Apart from being the only school in Perak with all these facilities, the school also makes it compulsory for all its form five students to take IT as one of the subjects in their Sijil Pelajaran Malaysia (SPM) examinations. The pioneer group of students who sat for the examinations last year did exceptionally well with only four failures out of 104. Even the teachers in the school were not “spared” the innovations as Tiong has made it compulsory for them to attend at least 1 1/2 hours of computer classes every week.With the availability of such facilities coupled with Tiong’s commitment to the welfare of his charges, student enrolment jumped to an all time high of 879. “I plan to limit the number of students to 600 by next year to have a more conducive learning environment.” A strict disciplinarian, the bespectacled Tiong also had his fair share of encounters with stubborn and naughty students who broke the windscreen of his car and splashed paint on it. and if they have certain projects to complete, they are allowed to use it in the evening in the main server room.